Only the athletes save the Olympic Games. Each Olympiad, winter and summer, the months before the competition are rancid with boycott, eligibility sqabbles, drug accusations and plain, adrenaline-fired suspicion. Then suddenly the flame is kindled, and it becomes the athletes' obligation to somehow redeem the whole Olympic movement by virtue of their performances, to leave flawed Games shining in memory because they produced a Shorter or Spitz, a Korbut or Comaneci. 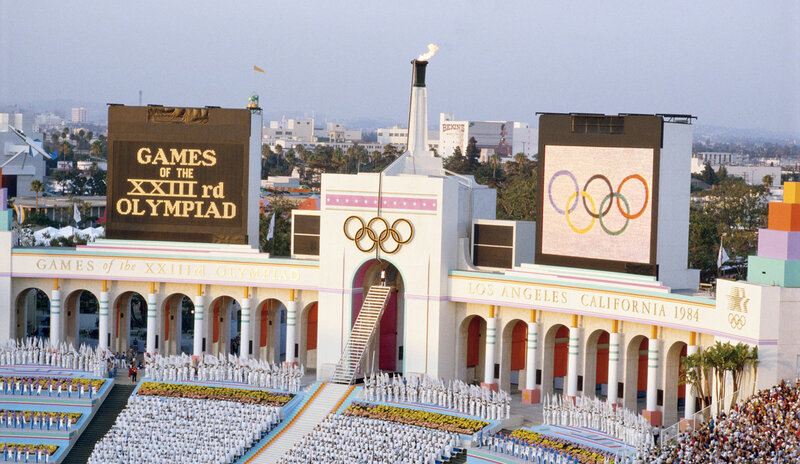 In Los Angeles, in these XXIII Summer Games, the athletes didn't even wait for the competition to start. They took a gorgeously produced opening ceremony at the Coliseum last Saturday and turned it into a powerful display of the binding emotions of international sport. They were so hungry to demonstrate the substance of LAOOC president Peter Ueberroth's words—"the finest group of young men and women ever assembled in the history of sport...the best hope for the future of mankind"—that they broke ranks, embraced and lifted the formality of the ceremony into something containing elements of both pagan rite and sacred affirmation. "It felt," said Canadian basketball player Bev Smith, walking, stunned, from the Coliseum, "like it was supposed to feel." And in the process, it made millions know that the Soviets had been wrong to boycott and to pressure their satellites to stay away. Wrong simply because they missed a great time. "If they had been here, it would have been perfect," said Robert Pariente of L'Equipe, the French sports newspaper. "It was the best opening I have ever seen." Last One In Is The U.S. Open Champ! Will Boston spring for the millions to keep Jim Rice, its Maestro of the Green Monster, playing in Fenway? Of course, it didn't start out that way, but with the usual snarl of pre-Olympic haggling. Libya's six-member team withdrew on July 27 after three journalists from that country were denied visas by the State Department for security reasons. The Soviet bloc boycott and the possibility of another no-show in four years in Seoul, South Korea (whose government the Soviet Union doesn't recognize) caused 1964 swimming multi-gold-medalist Don Schollander to say, "It will be 20 years between Olympics that have everybody, from 1972 to 1992." Security was tight. In Moscow, the Soviets were citing the July 18 killing of 21 people in a McDonald's restaurant in San Ysidro, near San Diego, to support their assertions that life in Southern California is dangerously violent. They could take further ammunition from a second tragedy in Westwood, in which one pedestrian was killed and 57 were injured when a car driven by a 21-year-old man who spoke vaguely of a grudge against the police plowed into a crowd at 35 mph the night before the Games began. But no athletes were endangered. Indeed, two of the three Olympic villages, those at USC and UCLA, were so calm as to be described by the athletes as sanctuaries. The first security call at the Santa Barbara village was a fire alarm—tripped by a group of South Koreans cooking snake on a hibachi. And even the opening ceremony, planned by Hollywood producer David L. Wolper, seemed at first to prove only that when you live by the symbol, you risk dying by the symbol. The one that expired in rehearsal was a 22-year-old bald eagle, portentously named Bomber, who had been yanked out of the Patuxent (Md.) Wildlife Research Center to fly from a perch over a section of spectators in the Coliseum and land on a set of Olympic rings on the field. Overweight when he arrived, he was trained too hard and abruptly died of vascular collapse and an acute bacterial infection. "Smog," said cynics. "Stress," said the vet. For a while Wolper spoke of using a back-up golden eagle named Fluff. Ueberroth, apparently seeing no need to remind the Olympic audience that the LAOOC had killed the national bird, declared there would be none at all. "I thought this whole thing was going to be a chaotic mess," said U.S. shot-putter Augie Wolf. Others, marshaling for the lengthy ceremony, were hardly reverent. "The guy in the K mart told me this was the only suit like it in the world," said U.S. 5,000-meter runner Steve Lacy, strutting in his red, white and blue Levi Strauss parade uniform. "But now look. Everybody has one." While the athletes waited outside, the show in the packed Coliseum—93,000 spectators—went on. (Tickets had gone for as much as $1,000 apiece that afternoon.) The peristyle end had been transformed with magenta, turquoise and white into what seemed a pillared cake supporting the Olympic torch. For an hour and a half the proceedings were sustained by sheer show-biz effort. There were copper kettledrums and bannered trumpets. There were chimes and cannons and crazily sweet flower girls in chiffon gowns and broad, translucent hats. An alarming hiss was the sound of a man strapped to a jetpack, flying in from the columns. He must have replaced poor Bomber. Huge copper and white balloons were released and soon were far up. The Olympic rings were painted by skywriters across a soft blue, copper-flecked sky. A 750-member marching band made an outline of the continental U.S. on the field—Hawaii and Alaska presumably having been consigned to the parking lots—and Hollywood pioneers pulled their wagons west to east, threw up flimsy towns, and danced too long. There were moments when you wanted the Soviets to see this. One was when 84 baby grand pianos appeared in tiers between the columns, each played by a blue-clad pianist, pouring out Gershwin's Rhapsody in Blue. There was an astonishing card section—the entire Coliseum crowd—which kind of reluctantly went along with creating, well, the people had no idea what, and then looked up, shocked, to find that they had emblazoned the great bowl with flags representing each of the 140 nations participating in the Games. There were jazzercise dancers and Hollywood musical numbers and big band swing numbers. What all this had to do with sport wasn't to be asked. It was prelude. It was puff. But Rhapsody in Blue gave you goose bumps on the bottoms of your feet. The thing was building. Then came the athletes' march. Greece, as the ancient originator of the Games, led, followed alphabetically by the other nations. Bahrain won for magnificence, with red and gold gowns and white headdresses. Bermudians wore Bermuda shorts. Australian women had koalas and emus on their dresses. The Eastern European boycott defiers, Romania and Yugoslavia, got ovations, even from the athletes of other countries. But none was so resounding as that for the immense, 573-member U.S. team, which marched in last. "As we came out of that tunnel into the cheers and flags," said U.S. basketball center Anne Donovan, "those cheers were for me." No athlete could compare the U.S. reception with any other Olympic experience. "Seventy-six was great," said U.S 4 X 400-meter relay team member Willie Smith. "But this time it's in America.' The American flag was carried by hammer thrower Ed Burke, 44, who kept it high with one hand, reminiscent of Soviet weightlifter Leonid Zhabotinski, who carried his nation's flag in Mexico City in 1968. The U.S. team stretched 150 meters around the track, it's members becoming delirious as the noise mounted. When they at last found places on the infield, four and a half acres were filled with nearly 8,000 athletes. Ueberroth spoke of the power of sport to advance peace and understanding. IOC president Juan Antonio Samaranch said, "Our thoughts also go to those athletes who have not been able to join us." From a bulletproof booth high up in the press box, Ronald Reagan, who had spoken to the U.S. team earlier—"He said everyone has the desire to win," said Wolf, "but you gotta have the desire to prepare, too"—transposed the two phrases of his prescribed 16-word speech, saying, "Celebrating the 23rd Olympiad of the modern era, I declare open the Olympic Games of Los Angeles." Go, get set, on your marks. Wolf leaned to Burke on the infield and said, "How's the heart, Ed?" "Racin'," said Burke. "I may not even bother to compete after this. How could I get any higher?" The Olympic flag was carried in by former U.S. medalists Bruce Jenner, Wyomia Tyus, Parry O'Brien, Al Oerter, Billy Mills, John Naber and Mack Robinson, and Bill Thorpe Jr., grandson of Jim. While a 1,000-voice choir sang the Olympic Hymn, two flights of pigeons wheeled in the perfect golden twilight. And then the torch. It was carried into the stadium by Gina Hemphill, Jesse Owens's granddaughter. Of all of the traditional symbols, the torch is the most potent. It represents the ancient fire passed down, 2,760 years since the first Olympics in Greece, and it drew the athletes irresistibly. "That's when I cried," said Donovan. In surges, athletes broke ranks and pressed onto the track. Hemphill was forced to slide and weave to get down the backstretch. She isn't a highly trained runner. It seemed she might not make it. When the Olympians closed in, you saw her only by the light she raised. The moment was dramatic to the point of seeming surreal. When she ran free of the crowd, the stadium sighed in relief. After a lap, she handed the flame to 1960 Olympic decathlon champion Rafer Johnson, who ran to the peristyle end, mounted the permanent steps, and then, powerfully, with his left hand steadying him, for he had slipped and almost fallen in practice, continued up a further flight of stairs that rose from the top of the steps. At the apex of his climb, he turned and saluted the stadium with the torch. "He was like a god up there," said Canadian decathlete Dave Steen. Johnson ignited a fuse above his head, and the fire was carried to the Olympic rings and on up to the main torch. And the reaction then, over such a simple thing as a leaping flame, isn't easily understood, even if profoundly experienced. Perhaps international sport becomes more precious as other instruments of peace are seen to be withdrawn. Perhaps the flame's power is in its affirming our ability to grasp something good that transcends our own lifetimes. The athletes' and officials' oaths were taken, Edwin Moses drawing a moment's blank that had the crowd aching for him before he finished. No one spoke extraordinarily well in this ceremony. The effect of it came from other than words. From music, yes, Beethoven's Ode to Joy seems always a fine summation of this delicate rejoining of the world, of the elation that flows from having once more achieved it. But in no Olympic opening has that elation been carried to greater heights than in Los Angeles. Urged in song to "reach out and touch," the athletes began to join hands, to form lines. A wing of white doves, saved for last, flew in the same sky as a pair of menacing black helicopters. Concussive fireworks cannonaded overhead. Irish male athletes danced a jig. Canadian women formed a cancan line. Italian men ran to kiss women of the choir. "You couldn't keep people apart," said an exultant Antonio McKay, the U.S. 400-meter hope. "All the other countries were grabbing each other, squeezing each other. It just moved me like nothing else in this world." "There has never been anything like this," said U.S. high jumper Dwight Stones. "I stayed as long as I could, just to soak up the energy." The British and Brazilians danced so fiercely it looked dangerous. "It was more like a closing ceremony than an opening," said U.S. triple jumper Willie Banks. "Everyone radiated fantastic love and friendship." The teams didn't regroup well at all. U.S. basketball player Sam Perkins could be seen doing a short high five with a gowned and turbaned Sudanese. "It kept on and on," said U.S. sprinter Harvey Glance. "The athletes haven't had this for years." "It actually is a little disconcerting," said 1976 Olympic discus champion Mac Wilkins of the U.S., sort of at bay, surrounded by an excited Hawaiian dance troupe. "There has to be something to look forward to. This seems like the last day of the world, but we have some heavy business to tend to before we go completely wild. But hey, I'm not ready to leave, yet." He seemed to be trying to continue, but was quite submerged in hugs, drowned out in squeals. McKay was marveling nearby. "You wait," he said. "This is going to charge us up and set us free. You're going to see some great performances now." PHOTOPHOTOHigh-flying hoopla included Sam the Eagle in the wings as the rocketman did his gig.PHOTOA bright barrage of balloons rose into the stratosphere from the packed Coliseum.PHOTOThe march into the Coliseum was a five-ring eye-opener.PHOTOSpectators were overjoyed when their card trick turned out to be a real flag-raiser.PHOTOBurke singlehandedly led the U.S. squad.PHOTOThe U.S. team featured a lot of flags and pigtails, but these were stick-outs.PHOTOThe colors of 140 lands massed for the oath taking.THREE PHOTOSHemphill was swarmed before she passed the flame to Johnson, who took it up—and up.TWO PHOTOSAt the ceremony's end, good-luck wishes were punctuated by the rockets' red glare. And then the athletes burst loose.